Children in Conflict – Patrick F. Clarkin, Ph.D.
Screen captures featuring headlines concerned with civilian victims of war. UNICEF recently released a list of some of the most dangerous places for children to live. In various wars around the world, children have been killed, abducted, injured, raped, lost family members, and been forced into military service (“child soldiers”). In addition to the direct targeting of civilians, including children, war also creates indirect adversities including psychological stress, infections, and malnutrition. For example, in the ongoing conflict in Yemen, one million people have contracted the deadly diarrheal disease cholera, 600,000 of whom are children. The UNICEF Director of Emergency Programmes Manuel Fontaine stated that “Children are being targeted and exposed to attacks and brutal violence in their homes, schools and playgrounds. As these attacks continue year after year, we cannot become numb. Such brutality cannot be the new normal.” I think that is the right approach, to avoid normalizing the deliberate targeting of civilians, including children, during war. However, I don’t know that what Fontaine refers to as “the new normal” is empirically different from the past. While armed conflicts vary in the level of harm they inflict upon civilians, as the Howard Zinn quote above indicated, harm is inevitable. Current conflicts, as seen from a U.S. perspective. From the Council on Foreign Relations. 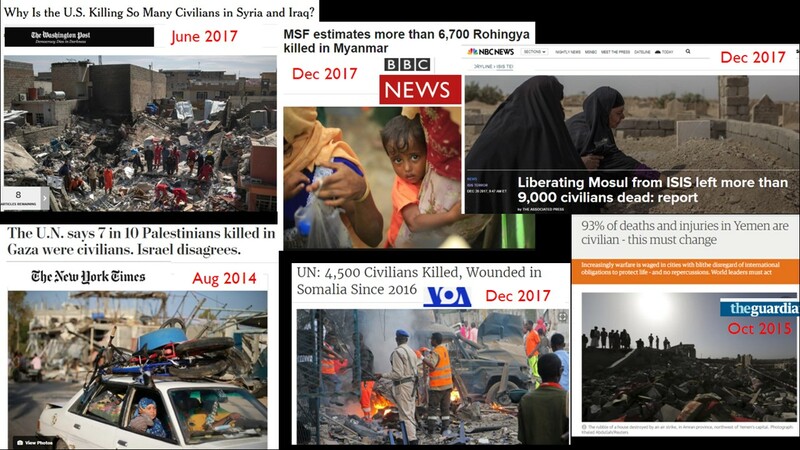 UNICEF’s examples of dangerous places included Afghanistan, the Central African Republic, the Democratic Republic of the Congo, northeast Nigeria, Cameroon, Iraq, Syria, Myanmar (Rohingya in the west, and various ethnic minorities in the east), South Sudan, Somalia, Yemen, and eastern Ukraine. 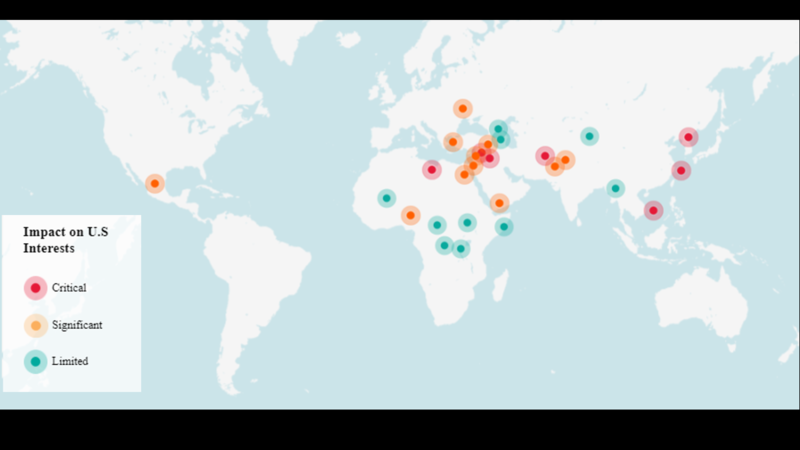 In essence, nearly all ongoing moderate to high intensity scale conflicts made UNICEF’s list (as seen in the map above). What this suggests is that atrocity is an inherent feature of war. This is despite international agreements like the Geneva Conventions that decrees that civilians should be given protected status and should not be considered legitimate targets. On this site, I’ve written about the My Lai massacre committed by American soldiers against Vietnamese civilians. But the Viet Cong also committed atrocities of their own, slaughtering 200 civilians (mostly women and children) at Dak Son. Just over a year ago, the UN reported that civilians were being killed in the streets of Aleppo by pro-government Syrian forces, in what was described as “a complete meltdown of humanity.” Today, the bombing of Syria still continues, with reports that 100,000 civilians have fled Idlib, and hospitals have been targeted by air strikes. Finally, humanitarian organizations claimed that air strikes by the U.S. led coalition against Islamic State killed up to 6,000 civilians since 2014, a number much higher than the 800 figure provided by the U.S. Examples of atrocities stand out for their brutality, but they are not as uncommon as might be expected. Several studies from armed conflicts around the world demonstrate that civilians are often more likely than combatants to be killed or injured, either directly or indirectly (see Roberts, 2010). It is inherently difficult to get precise estimates on the number of deaths that result from any conflict because unsafe conditions prevent data collection. Retrospective population surveys are the preferred technique, since passive data collection, such as through morgue tallies or media reports, may miss some cases and underestimate casualty estimates (Alkhuzai et al, 2008). In addition, the exact proportion of civilian-to-military casualties varies by conflict, and this is often contested. Still, general trends from global conflicts over the past several decades indicate that civilians inevitably comprise a substantial proportion of victims. Estimates of the proportion of casualties occurring among civilians are quite consistently above 50%, though they may range from perhaps as low as 40% (in the case of Bosnia) to as high as 90% (in the cases of Cambodia and Rwanda) (see Roberts, 2010). Nonetheless, whether deliberate or incidental, civilian casualties are unavoidable. That fact must be factored into the calculus when nations decide whether to engage in war. The surgeon Gino Strada, who has worked in war zones around the world, once referred to war as “the biggest tragedy in public health.” Numerically, that may or may not be true. Depending on where one lives, the biggest public health concerns may be heart disease, malaria, or substance abuse. Still, the framing of war in public health terms shifts the focus away from political and military gains and losses to where it belongs – on the inevitable suffering of innocent people. This entry was posted in War and health and tagged Civilian casualties, Gino Strada, Howard Zinn, Syria. Bookmark the permalink.